A newly born Masai Giraffe calf with its Mother in Nairobi National Park, Kenya. The skyline of Nairobi is seen on the far horizon. 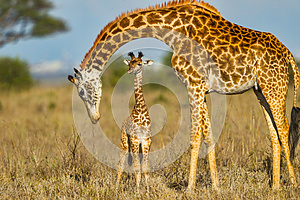 The arched neck of Mother Giraffe frames the baby perfectly. These animals are also known as Maasai Giraffe, Kilimanjaro Giraffe or Kenyan Giraffe.